Protecting our natural resources and wildlife habitats is mission number one for millions of scientists and concerned citizens across the globe. And, technology that has been making news for innovative deliveries is making a dramatic impact in how nature conservation efforts are carried out and measured. That’s right, we’re talking about the use of Unmanned Aircraft Systems (UAS), or drones, in conservation applications. They are helping wildlife biologists and conservationists better map and track natural resources and endangered animals in remote areas, all while reducing the impact on the environment. From monitoring rhino poachers in Africa to surveying endangered palm trees in Hawaii, drones have been crucial to conservation and environmental protection efforts. “Our latest research has demonstrated that a very high degree of precision can be achieved when using drone technology to monitor wildlife,” said ecologist Dr. Rohan Clarke who conducted a recent study from Monash University in Australia. The results of the study suggest that drones are actually better at wildlife monitoring than humans. This is because UAS are able to monitor remote areas that are difficult or even too dangerous for humans to reach. They can also get a much wider view than possible for someone on the ground and require less expense (and risk) than using a helicopter. The study also found that drones along with applications that run on an Operational Intelligence (OI) platform can even be more accurate and effective than operations carried out by traditional ground-based methods. “It’s highly likely that in the future, drones will be used to monitor populations of animals, especially in inaccessible areas where on the ground surveying is difficult or impossible. This opens up exciting new possibilities when it comes to more accurately monitoring Earth’s ecosystems,” said Dr. Clarke. For instance, some wildlife parks in Africa are even tracking and stopping poachers using the technology. Particularly in South Africa, where poaching has reached unprecedented levels, conservationists have begun employing anti-poaching drones in wildlife reserves to curb the killing of endangered species like rhinos. The unarmed drones are making a significant difference in anti-poaching efforts that traditionally relied on the “boots on the ground” of rangers on patrol. Once in flight, conservationists can scan live video from the UAS’ thermal imaging camera to monitor for heat signatures of poachers stalking through the bush to hunt rhinos. Drones are not only coming to the rescue of endangered wildlife, they’re also being used to defend the natural spaces in which they live. The pressure is increasing on natural resources in almost all conservation spaces on the planet. From Hawaii to the rainforest, drones are aiding in the fight against humanity’s footprint on the environment. However, it takes a serious threat to convince the U.S. National Park Service (NPS) to allow drones in its airspace, and for the Pu’uhonua O Honaunau National Historical Park on the island of Hawaii that threat was the overwhelming loss of palm trees. In an effort to address the increased loss, Pu’uhonua O Honaunau sought a new strategy to inform officials about the health of the palm trees and other plants within the park’s jurisdiction. During the project last July, the park’s ecologists used drones to make better-informed decisions for the palm trees by discovering the root cause of the suffering. Drones were less disruptive than other examination options, such as surveying each tree from a helicopter or truck, which could further lead to damage of the site. The UAS used photogrammetry and multi-spectral analysis via high-quality cameras for visible light, as well as a hyper-spectral system that allowed photos into near-infrared. “Following the NPS procedures to get the drones into the park took a lot of effort,” said the chief archaeologist for the park, Adam Johnson, “but it was worth it for the efficiency in surveying the park’s hundreds of trees.” Beyond convincing his boss, he said there were an additional eight months of work and five levels of approval to go through. The preliminary results have indicated there could be a fungi attacking the trees and potentially insects as well. Drones don’t offer just a safer way for scientists to observe their subjects; they’re often less costly, more efficient and more precise than traditional approaches. 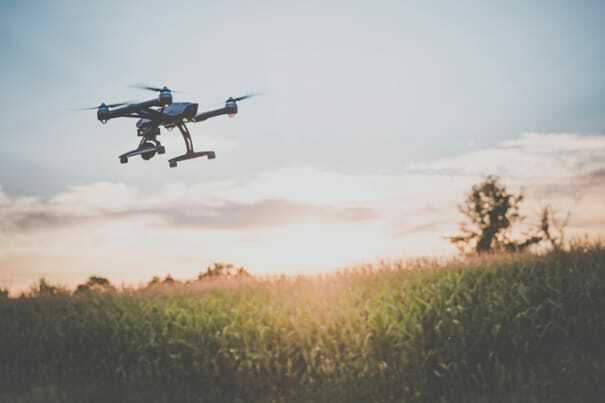 Although the industry has faced concerns about the number of drones in our skies, OI can provide a key foundation needed for drones to continue to protect our environment. While flying over mountainous landscapes, around major rivers or through forests, drones can collect GPS coordinates, real-time video and still images of the situation, helping scientists set priorities back at mission control. This data can be overlaid on area topography and maps using OI technology. Sending out a UAS to survey an area requires minimal personnel, and it can be done in a matter of minutes. Drones can act as surveillance and security for wildlife and the environment. Because they allow situations to be viewed from on high, operators can monitor for accidents or suspicious activities and relay information back to officials who can signal a manned response if needed. And when coupled with OI technology that can aggregate various data sources to provide greater situational awareness for conservationists, UAS technology can be a literal lifesaver for wildlife and its natural habitats across the globe.